MAD Scientist Associates values giving back to the community and helping to educate them in the areas of wetlands and ecology. 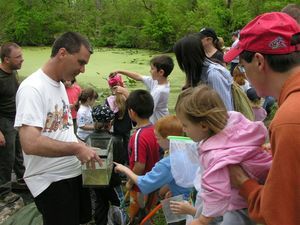 An Annual Wetland Workshop is led by the MAD team and sponsored by the City of Westerville Parks and Recreation Department each May. See our volunteer calendar in March or April for more details. There are usually 2-3 local volunteer events each spring and fall. MAD Scientist Associates is involved in a variety of Central Ohio area community projects. Involvement includes educating school and community groups about wetlands, and offering their ecological expertise in plant identification and site management. Below are some of the groups with which we’ve worked. Each year, the MAD Team leads a Wetland Workshop for the City of Westerville, usually on a Saturday morning in May. Check our News and/or Volunteer & Events Calendar pages in the spring for more details. Want to join us? Sign up on our Volunteer page to get email notifications.